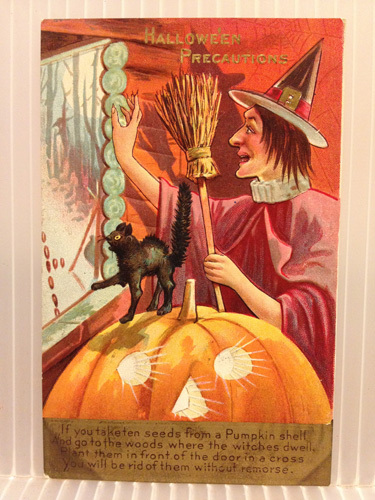 The NY-Historical Society digs up some seasonal lore to regale your friends with. Fall’s big eating holiday is generally considered Thanksgiving, but Halloween its own fascinating food traditions as well. 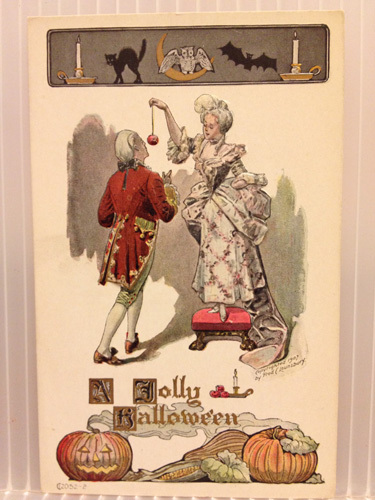 From trick-or-treating for candy, to bobbing for apples and carving pumpkins, the holiday—which is itself mish-mash of holidays—features tons of food-related customs, some of which I found commemorated on these postcards from the New-York Historical Society Library. Bobbing for apples has long been a staple of Halloween parties, and who else learned as a kid that if you cut an apple in half at its equator the seeds look like a star? Some liken the star to a pentagram, which Celts believed was a fertility symbol. Once the Romans began ruling the Celts, they brought their belief in the Goddess Pomona, who ruled over gardens and orchards, and whose symbol was the apple. 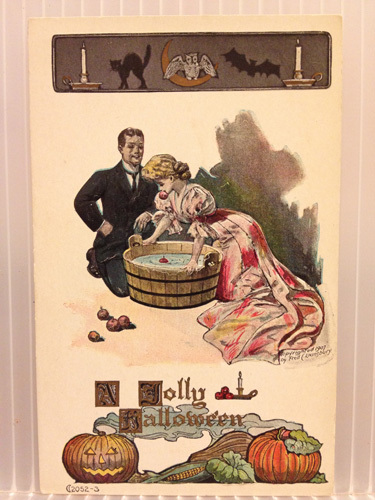 Pomona’s festival took place at the beginning of November, and bobbing for apples was a common practice to celebrate. According to Halloween and Commemorations of the Dead by Roseanne Montillo, one legend has it that the first to take a bite of a bobbing apple would be the first to marry. Another says that if you put the apple under your pillow, you’d dream of your future spouse. Spooky. One legend has it that the first to take a bite of a bobbing apple would be the first to marry. Spooky. Jack-o’-lanterns are another huge part of Halloween culture. According to one tale, a man name Stingy Jack spent his life tricking the devil, and when he died neither heaven nor hell wanted him, so he was doomed to walk the earth with a carved turnip as a lantern. According to Cindy Ott, author of Pumpkin: The Curious History of an American Icon, it is another name for the will-o’-the-wisp, a light eminating from a dark forest or swamp that was attributed to ghosts. It was not until Washington Irving published Sleepy Hollow that the phenomenon of creepy lights in the woods was connected to pumpkins. 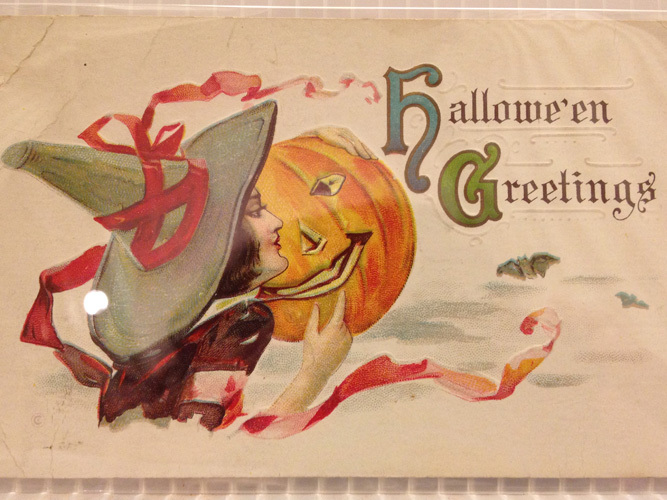 Another pumpkin tradition is marked on this postcard from 1946, which says, “If you take ten seeds from a pumpkin shell / And go to the woods where the witches dwell / Plant them in front of the door in a cross / You will be rid of them without remorse.” So now you have something to do with those jack-o’-lantern innards!